Father Rutler addresses the collapse of the liberal arts in education and its consequences for perceiving and accepting the logic of Catholicism. Father George Rutler was ordained to the diaconate in Rome by His Eminence William Cardinal Baum in 1980 and received priestly ordination in St. Patrick's Cathedral at the hands of His Eminence Terence Cardinal Cooke in 1981. He served as Associate Pastor of St. Joseph's in Bronxville; Our Lady of Victory in the Wall Street area; and St. Agnes, in Manhattan. For ten years he was National Chaplain of Legatus, the organization of Catholic business leaders and their families, engaged in spiritual formation and evangelization. For 13 years his weekly television program has been broadcast worldwide on EWTN. Father has lectured and given retreats in many nations, frequently in Ireland and Australia. Cardinal Egan appointed him Pastor of the Church of Our Saviour, in September 17, 2001. 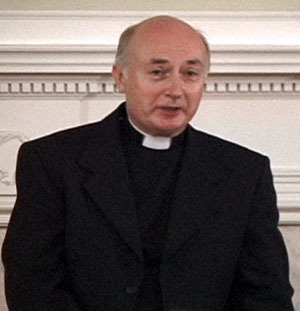 Born in 1945 and reared in the Episcopal tradition in New Jersey and New York, Father Rutler was an Episcopal clergyman for nine years, and the youngest Episcopal rector in the country when he headed the Church of the Good Shepherd in Rosemont, Pennsylvania. He was received into the Catholic Church in 1979 and was sent to the North American College in Rome for seminary studies. Father Rulter holds several degrees from the Gregorian and Angelicum Universities in Rome, including the Pontifical Doctorate in Sacred Theology and studied at the Institut Catholique in Paris. Father Rutler contributes to numerous scholarly and popular journals and has published 14 books on theology, history, cultural issues, and the lives of the saints, and also one book on sports, as a member of the U.S. Squash Racquets Association.